It’s been a weird Summer for us this year. Not only has it been especially hot, but we had a three week break in the middle – a vacation to see parents and grandparents and to have fun. We live in California, so our travels take us to the Midwest and the East coast. It’s hard being so far away from our families, but we’re fortunate to make the trip every few years. BTW, I packed almond flour in my suitcase and enjoyed a low carb bagel for breakfast every day. I sure did! School starts up next week and we’ll exchange our slow Summer days for homework and hectic schedules. For us, the grill is still one of the best ways to get food on the table fast and hamburgers are a favorite! With a little planning, we enjoy the occasional low carb bun with our burgers on those days we don’t feel like having a bunless burger. How many of you have missed a proper burger in a hamburger bun? I know I have. Cheap squishy, white bread hamburger buns? Loved em. Whole wheat buns with sesame seeds on top? Double loved ‘em. Gourmet brioche buns buttered and toasted? I think I just drooled thinking about them. I’m sure, like me, you enjoy your low carb burgers either naked or lettuce wrapped because bunless burgers are fabulous! Especially my AWESOME DELICIOUS gourmet low carb burger recipe. But I do miss the convenience of eating my hamburger on a roll. Over the years I have tried several low carb hamburger roll recipes. Have you tried “oopsie rolls”? They aren’t too bad as far as bread substitutes go. They’re easy to prepare and make a passable low carb bun, but they tend to break apart and get sticky overnight. Psyllium buns and rolls are pretty good, but they have so much fiber! They are super filling and not everyone can handle that much fiber in their diet. Our beloved low carb Fathead dough recipe comes to the rescue again. 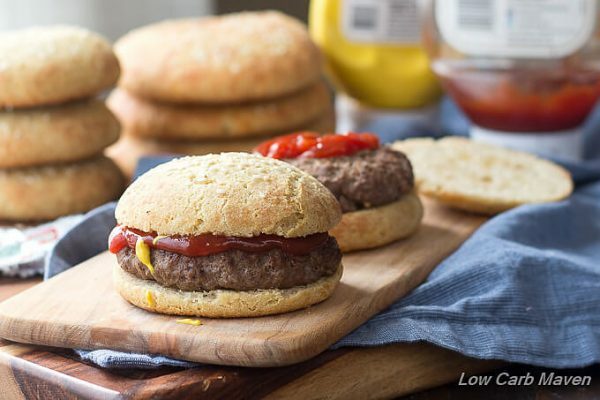 We fell in love with it as pizza crust, then hot pockets, dinner rolls, low carb bagels and now hamburger buns. What I really like about this recipe is that it is fast and easy to make only taking about 20 minutes. They can be made ahead of time and kept in the freezer or fridge. 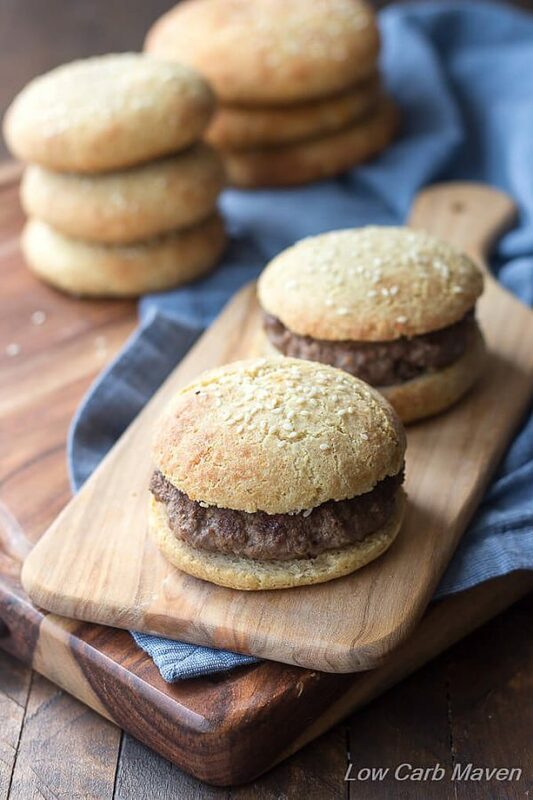 Does this low carb hamburger bun recipe taste exactly like bread? No. Is the texture of a soft potato roll or a flaky brioche bun? No. This is low carb bread made from mozzarella cheese and almond flour. But, It’s a sturdy bun that doesn’t fall apart and it tastes pretty great. 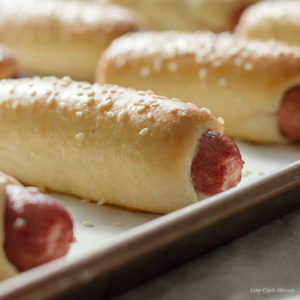 It’s also great wrapped around a hot dog if you are hungry for burgers and dogs (see my bagel dog recipe). 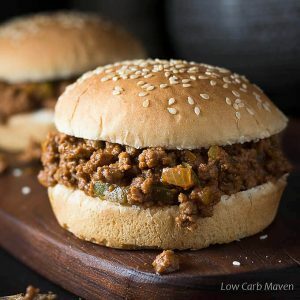 We just tried these on low carb sloppy Joes – AMAZING! 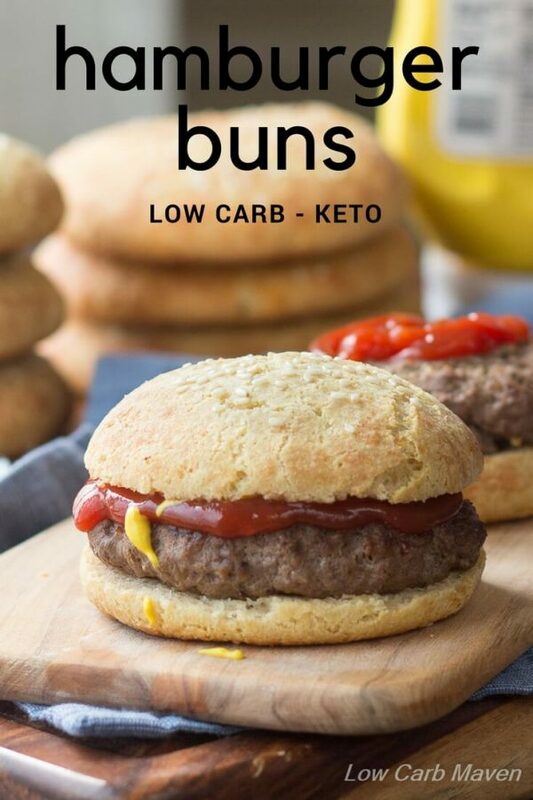 Each Low Carb Hanburger Bun is 4 net carbs. 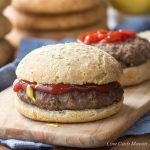 Low carb hamburger buns are fast and easy to make with the fathead dough recipe. Bread-like in texture, they're the perfect low carb keto sandwich roll. Add the dry ingredients and process until a dough forms. It is very sticky! If it's too sticky to handle, let it cool for a few minutes. Preheat oven to 400 F and place rack into the middle of the oven. Line a baking sheet with parchment. Place cheap-o metal pan at the bottom of the oven. Place 6 ice cubes in the metal pan at the bottom of the oven. Then place the rolls into the oven. This will help the rolls rise and spread. Bake for 12 minutes or until the outside has browned. They will still be soft, so let them cool before removing from the baking sheet. Once cool, store in a bag in the refrigerator. Warm slightly to enjoy. *These are NOT fluffy buns - they are firm, but great for holding burgers. They are probably only 4-inches in diameter and 1/2-inch thick in the center. See pictures! 1. If your rolls flatten out too much, add a little more almond flour (about 2 tablespoons). 2. If your rolls don't flatten enough: Make sure your almond flour is fluffed up and free from lumps, don't pack the almond flour when measuring, the dough spreads but not a lot so press on the dough to flatten it out, if your rolls aren't spreading enough, use a little less almond flour. My rolls were about 4 inches round (10 cm). They are small, but perfect for home burgers. 3. If you dough is too hard (cold) or too dry, the rolls won't rise/spread as much. Place the dough in the microwave for 15-20 seconds - just until warm and then shape. Can you substitute dairy ingredients with non dairy ingredients? Can you use psyllium husk instead of almond flour. I just made these & they are delicious!!! Thank you. I just made these. Followed the recipe to the letter, except made 6 buns (for sliders) rather than 5. They are absolutely delicious. I made a ground sirloin slider with one. Delicious and carb-guilt free. The dough cooks up so delicious I will use it to make other types of bread. Thank you. Made these today. Sadly they did not rise. They look more like a biscuit/scone. They taste good though and worked with a tiny 1 oz patty just fine. Heh. Made these today and they were delicious. I put a little chive oil on top and they were beautiful. Thank you for the great recipe. These low carb hamburger buns are surprisingly tasty with a pretty good texture. I used Organic Valley mozzarella. Thanks! Oh my gosh, I could cry! You gave me buns back! These are phenomenal! I baked these last night… omg! They ate delicious!!! I just had a turkey burger for lunch and I was in keto heaven! Thank you for this recipe!!! Is the calories for the whole recipe or for One Bun? I didn’t have oat fibre or protein powder so I just used extra almond meal and it was fine. 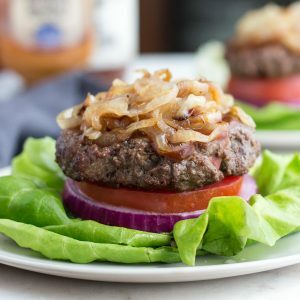 We are eating Keto so I made these last night for our burgers and they turned out great! My husband was a little sceptical about eating something that’s not bread but he loved it! I just mixed the recipe in a bowl (no food processor) which was fine, and because I misread the recipe I only made it into 4 portions which made some really decent man size buns, and I completely forgot to do the ice. They were light, fluffy, and I’ll definitely be making this recipe again! Hi, I was just wondering what brand of oat fiber 500 do you use? These were truly amazing. Thank you for sharing the bakers tip. I made these tonight with a turkey burger. It was absolutely delicious! I didn’t miss a regular bun at all! I didn’t have sesame seeds so I omitted them. I ended up making this tonight. Omg so good! Exactly what my family was missing with our Keto diet. Thank you! How long are you supposed to freeze the dough for before baking? I do not have any cream cheese in my fridge, would more mozzarella work? Thanks for any feed back! Thank you SO much for your quick response! I tried your trick and they came out beautiful! Thank you so much, pulled pork tonight on the wonderful buns. Like Darrell, mine turned out very small and dense. I read the troubleshooting and it says that can be from too cold, which they weren’t as I didn’t put them in the freezer…could that be it? Too warm? They weren’t too wet either. I have been told you can use this recipe to make a loaf of bread, but how long would you cook it and at what temperature? I have done the Flathead Pizza dough and liked it. I make it into a loaf. Add some herbs and seasoning and it turns out wonderfull. Can I substitute the oat fiber for flaxseed? Thank you for the quick response! I made them using the flaxseed, same ratio they came out great! Definitely making these again! I was craving a burger on a bun and made these. They turned out great, following the recipe to the letter except adding on 1.5 minutes to the time because mine were not brown at the 12 minute mark. They will make a fine sandwich and I plan to try toasting them split in half for an occasional eggs benedict. I am not a great cook, but I reluctantly attempted this recipe. I don’t have a food processor, so I tried with my KitchenAid mixer instead. Oh. My. Goodness. These were amazing. Turned out great with minimal effort. I used one for a breakfast sandwich, then froze the rest. Top notch! I took out a frozen one today and threw it straight in the toaster oven at 350 degrees with pizza sauce, some mozzarella, a couple pepperonis, and some crushed red pepper for about 10 minutes and they make the most delicious little mini pizzas! Thank you for this recipe, it’s a life saver! Thought you might like to know after enjoying my burger on the 4th, I made cinnamon rolls with the dough today. I rolled it thin between two sheets of parchment paper, sprinkled it with stevia and cinnamon, and rolled it up. Sliced it fairly thick, and cooked it at the same time and temp, and they were perfect. I winged it to make a cream cheese frosting with stevia, cream cheese, butter, and a dash of vanilla. They were great! I’ve made fathead bread before, and it always made my stomach a bit queasy. The only difference is the protein or oat flour that you added, and OH! what a difference. I used unflavored Isolate protein powder. These taste absolutely delicious!!!! I just had a bite with butter on it. Yummy! You just made my 4th of July better!!! I am absolutely loving this recipe! I personally have just been mixing the cheeses and egg with a hand mixture without microwaving, and it makes the dough significantly less sticky! Turns out great Everytime I make it for buns or pizza, thank you so much for the amazing recipe! I just made these and they came out great. The are very filling! It was a pleasure eating a hamburger with a bun again. Made these buns for dinner tonight. I used plant protien and put a pie plate with a few cups of water in it rather than ice cubes. I split the dough into 2 large buns and cooked for 14 minutes. Rather than make 4/5 , its easier for my wife and I to make a regular size burger and cut it in half to share. They came out perfect! Golden brown, soft on the inside, and did not fall apart when eating our burgers. They felt heavy yet were not a dense sponge like most keto bread products ive made. Closest thing to a real bread product ive had or made yet. Thank you for sharing your work with the community! Followed to the T. Came out very small and like rocks. What an awesome recipe! I made 4 buns instead of 5 (because… 4 eaters) and used them to make cheeseburgers. They kept their shape very well (I used the protein powder) and were delicious. I see more burgers in my future. Many thanks for the recipe! You just changed my world with this recipe. Amazing. Hi – I made these last night using the extra almond flour (no oat / protein). I made one bigger and one smaller. I baked for 13 minutes until slightly brown. After cooling I cut them open and they were still moist in the middle. I ended up toasting them on the bbq (face open) for a few minutes to try and remove that. What did I do wrong? Also is there a way / trick to make them a bit fluffier or less dense? Thanks so much for this recipe! I made these and they tasted great, but I found they fell apart when eating them with a home grilled burger. Hey Lisa – I had the same thing. I think putting lettuce on the bun first would help a lot as it’s the moisture that did the same thing to me. I ended up flipping mine over and it held together. But I realized I should have put dry lettuce down to stop the bun taking all the moisture from the burger. Holy moly. We’ve been keto for a few months now, and while I’ve made fathead dough for pizza, I didn’t think to turn it into rolls. This was absolutely delicious! For those who don’t have a food processor, I squashed it all together by hand – however I only had medium eggs on hand, so perhaps that was why I didn’t have too much stickiness? I put an egg wash on top and sprinkled on some sesame seeds before I put them in the oven. I will definitely be making these again. PERFECT! They came out perfectly and taste great. Very satisfying. Thank you, thank you. I started the LCHF lifestyle two months ago. For the most part I do well with my new eating habits. However, I am very tired of eating hamburger patties without a bun. I found your recipe today, and made it within the same hour. I’m so thrilled to report it was a total success! ! ! ! ! I enjoyed every bite of my burger and BUN. Looking forward to making pizza crust with this recipe over the weekend. These are freakin delicious and much easier for me to make than the cloud bread which I had trouble with. Thank you so much! I shaped them into funky hot dog buns and they turned out just fine. Also, I only had Monterey jack and they cooked up the same as yours as far as I could tell. I made these the other day. Followed the recipe ingredients exactly, HOWEVER, i only made 4 buns. I spread them out to fit my burger size better. I also added sesame seeds to the top. They were really, really good. I refridgerated in a ziplock before using then, took them out, cut them and heated them with avocado oil to brown each inside. Soooo good. Also, cooked for 12 minutes and came out perfect for 4 too. Can you substitute cheeser cheese? To replace the mozzarella. Super easy and can be made while preparing the burgers themselves. These turned out perfect, though I think I need to make them a bit bigger than I did. Easy to add herbs to the mixture too. Thanks much! I wouldn’t say flatten out the dough but to make a 2 inch round dome. If you flatten it out you get something good for a flatbread but no where near the rise you need for a bun. Tastes great but I had to make a second batch because it was way too flat for a burger bun. I noticed the bun recipe calls for baking powder while the rolls call for powder soda. Is this correct? I’m making these tonight to take along to the movie tavern. I’ll be munching on a burger not feeling the least bit deprived while watching the Avengers! Thank you! I love these. Such a good recipe. I use them for sandwiches more often then hamburgers. We even took these on the plane when we went overseas. Love them! Any chance you could sub oat flour for the almond flour? Just made these and they were delicious! Of course I made 4 instead of five and I know I’m going to regret asking this question lol but when you say it make five buns are you referring to 5 buns total, meaning one per top and bottom and you would have one left, or do you slice one of the 5 buns in half to make one burger? I hope that made sense? I’m addicted after only the first time making these buns! I don’t own a food processor so I used one of my Cutco knives to cut through the mozzarella then a fork to smooth out the ingredients with the added egg then mixed with my mixer.My kids loved them too! We used them for burgers, my youngest made a pizza burger and said he didn’t like them, he Loved them! I’m a huge foodie and finding this will keep me Keto! Thanks so much! I have made this recipe several times for buns and pizza dough, and they were alright. That was BEFORE I had a FOOD PROCESSOR!!!!!! This time they are amazing! I also have learned to roll them out exactly how I want them shaped when they are done baking! They don’t bake like cookie dough balls! Amazing recipe that I will use forever! Was going to post a picture but I don’t have the option!! Did you bake the pizza dough with all the toppings or separate? Tried these with our burgers tonight and the worked great. Taste was really good, kind of a mix between cornbread and cheesy bread. Held the burger together well and I had a double with cheese. I made them as the recipe states without the oat fiber so I used the additional almond flour in its place. Buns were really dense, filled my wife and I up much faster than before with our bun less doubles. Will use this recipe again for sure and will continue to experiment to see if we can make them a bit lighter and more fluffy but still hold the burger. Thanks for the recipe, my wife and I started keto thanks to a friend around the beginning of the year (officially 11 weeks today) losing 11 and 26 pounds respectively. The breads have been my most difficult hurdle and this helps a ton! I used this recipe to make pizza dough. It was delicious! I’ve made it several times for pizza dough and hamburger buns. Perfect every time. Thank you for the recipe! I made them today exactly as the directions. I made 3 versus 5 with the remarks about the size. My buns came out more brown and glossy on the bottom. They look very dry but I used my expensive ingredients on them so will eat them no matter what I won’t be using this recipe again. Hi Kim. I’m sorry you are disappointed in the recipe. They are dark and glossy on the bottom because of the cheese in the recipe. Cheese browns and gets shiny like that. Each of the subs listed in the recipe will produce slightly different results in texture of the end product. A few things contribute to dryness. I don’t know which combination of ingredients you used so I will address them all. But before that, all ovens are different and it helps to check on your baked goods at least 5 minutes before the specified time in any recipe when making it for the first time. Making the buns larger may have required longer cooking time and it may have resulted in over-browned bottoms. Always fluff up almond flour, coconut flour with a whisk to break up any lumps before using. If not, the compacted lumps will result in more of the ingredient used than stated in the recipe. Oat fiber produces more if a fluffy biscuit texture and since it is pure fiber, it can cause dryness if too much is used. Whey protein powder provides a great bread-like texture, but using too much can cause some baked goods to be tough or dry. That is why only a small amount is needed in baking recipes. Using too much almond flour will result in heavy and dry rolls. Can you do the recipe in weight for each ingredient please? Thank you for pointing out the chart. The only thing I’m missing the weight on is the grated mozzarella. There’s no conversion for that unless I’m supposed to use the Volume conversion which is in ml and not grams. Thanks, I just made them and they were INCREDIBLE. Can’t thank you enough for this recipe/process. I missed burger buns so much but now I got them back! I didn’t use oat fiber btw. Just more almond meal and they were still fantastic. Made these for lunch yesterday. Almost perfect my first time! So good. I will definitely use this recipe again. Thank you! Are the nutritional facts above per bun or the total of 5 buns? Hi! I was wandering if I substitute the oat fiber for chia fiber it will work?. Because in my country we don’t have oat fiber or those unflavored protein powders. I would like to try this tonight. These were wonderful! Very sticky we you warned but I followed directions and they were delicious. Pillowy soft and tasty. Thanks so much! I made these buns, tonight, for my husband and myself. They absolutely ROCKED! I think even my kiddos would’ve liked them. This is definitely going in my repertoire. These buns were sturdy enough to hold up to a bacon, Keto-chili, cheese and jalapeño burger! Absolutely great! Thank you so much for sharing this gem, with us! I’m going to try making this recipe for my diabetic husband. We now have to count carbs. I see that each bun has 4 ‘net’ carbs but can you tell me how many ‘actual’ carbs are in the buns? What if you don’t have a big processor? Will a kitchenaid mixer work? Your recipes always turn out perfect, great website! Would using a food processor make a difference in how these rise? I don’t have one (no room) and mixed by hand. They came out OK but almost totally flat. I used a 3.5″ egg round to shape them without compressing them any more than I needed to. Any tips to get mine looking closer to yours? I used baking powder. Maybe mine were just too wide when I flattened them out. The egg rings is 3.5″ across. I’ll make them smaller in diameter next time and add a little bit more almond flour. My dough wasn’t all that sticky, not like when I make fathead pizza dough. I used oat fiber. I wish I could post a picture! Yours are not flat compared to mine. I will keep trying, I like the flavor of these and am tired of lettuce wraps…lol! What recipe calculator are you using? I put these into MyFitnessPal and the calories, protein, and fat calculated out significantly higher than what you have listed. I’m super new at Keto (Like I’m only 4 days in) and I want to make sure all my macros line up to what they should be. These were excellent by the way… great flavor and very sturdy! It’s nice to know there is a really good bun option out there!! Hi Erika. I’m so glad you like the recipe. It’s not uncommon to get different nutritional counts on My Fitness Pal. I used a recipe/cookbook program called MasterCook. I enter all of the ingredients by weight. For almond flour, I weight it and choose the same weight in blanched almonds. It’s more accurate. Also be careful which cream cheese you enter, some brands have up to 3 carbs per tablespoon. If you have a recipe that calls for a 1/2 cup of almond flour, don’t choose the 2 tablespoon (1 serving) option 4 times, that will result in higher carbs. How long will they last frozen? This recipe was amazing! I made the buns and used them for keto Philly cheesesteaks! It was wonderful! 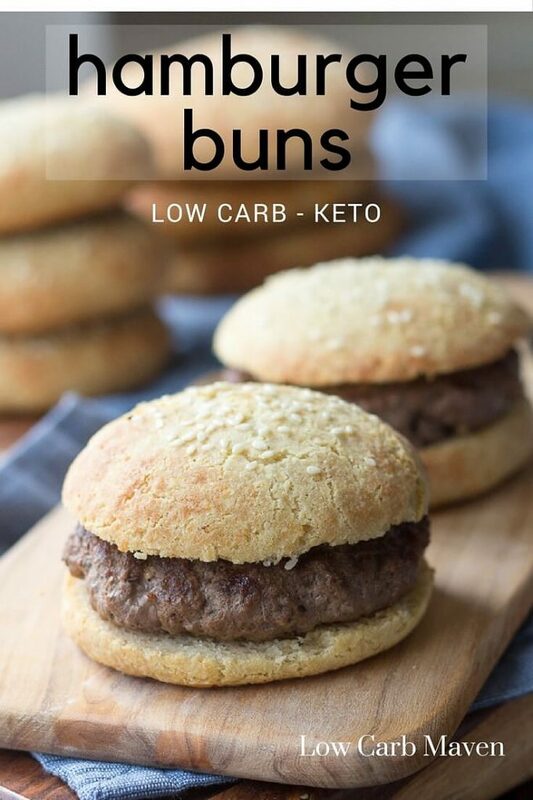 For the Low Carb Hamburger Buns. Is there a way to combine the grated mozzarella and the cream cheese other than using a microwave? I’d like to try this recipe, but I don’t use a microwave. These turned out so well Kim and so tasty. Nice to have a burger in a bun again. They are also great for tuna melts. Thank you for sharing this recipe. Sorry! In my excitement I didn’t notice the other comments. I see my question was answered. I don’t have oat fiber – can I sub in psyllium husk for it or am I better off using the protein powder? These look yummy! My husband is allergic to anything with almonds. Is there any other fours that I could use instead of the almond flour that would be low carb? Thank you for sharing this recipe! These made burger night a big hit! :) Wonderful taste, texture and held together “almost” until the last bite. ;) Yum. Can soy flour be substituted for the almond flour. If so would it be the same ratio? Can you use flaxseed instead of the almond flour or oat fiber? I want a nutritious bun to take on my upcoming camping trip. Does this recipe call for oat FLOUR or FIBER? The recipe says flour but you mention oat fiber in the comments. Oat fiber would be lower in carbs and is what I would prefer to use. Made these last night and they were so good! Husband loved them! Hi! Thanks so much for this. I’m one of those people who can’t handle the psyllium husk recipes. So…what’s best for this recipe: The oat flour, the protein powder, or the additional almond. Did you try all of them? I’m willing to buy the just-right ingredient. Thanks! I can’t have nuts (even though I love them)! Can I use the crunched up pork rinds or is there a different substitute you may recommend?